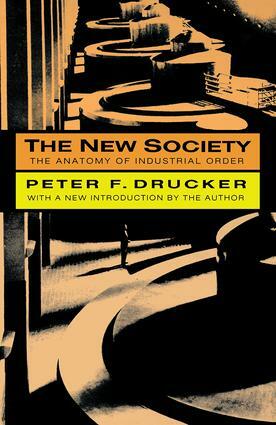 In The New Society, Peter Drucker extended his previous works The Future of Industrial Man and The Concept of the Corporation into a systematic, organized analysis of the industrial society that emerged out of World War II. He analyzes large business enterprises, governments, labor unions, and the place of the individual within the social context of these institutions. Although written when the industrial society he describes was at its peak of productivity, Drucker's basic conceptual frame has well stood the test of time.Following publication of the first printing of The New Society, George G. Higgins wrote in Commonweal that Drucker has analyzed, as brilliantly as any modem writer, the problems of industrial relations in the individual company or 'enterprise.' He is thoroughly at home in economics, political science, industrial psychology, and industrial sociology, and has succeeded admirably in harmonizing the findings of all four disciplines and applying them meaningfully to the practical problems of the 'enterprise.' This well expresses contemporary critical opinion.Peter Drucker's new introduction places The New Society in a contemporary perspective and affirms its continual relevance to industry in the mid-1990s. Economists, political scientists, psychologists, and professionals in management and industry will find this seminal work a useful tool for understanding industry and society at large. Can Management Be a Legitimate Government? Is There Really a Lack of Opportunity? Where Will Tomorrow’s Managers Come from? Is Bigness a Bar to Good Management? Is a Competitive Market Necessary to Management? How Much Union Control Over the Citizen?